Installation in Denver at SC17. 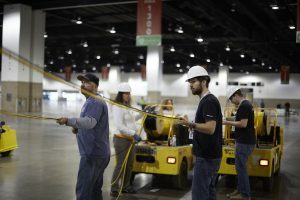 Change in SC18 infrastructure will benefit exhibitors in November. SCinet has supported two types of fiber optic cable to facilitate exhibit floor connections for many years, but that’s about to change. In order to consolidate inventory and reduce complexity, SCinet will only offer connections using singlemode fiber starting this November in Dallas. 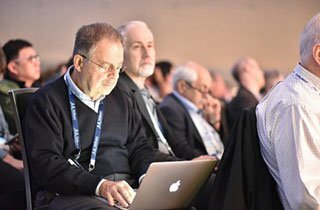 “Exhibitors and attendees in Dallas will be well served by the move to singlemode fiber,” said SCinet Deputy Chair Jim Stewart. “Exhibitors may incur some minor expenses in making the transition, but the change will immediately bring higher capacity and greater reliability. It will also position SC to more efficiently provide high capacity 1-to-100 Gbps service at the conference,” he added. SCinet will offer 1, 10, and 100 Gbps Ethernet connections delivered over singlemode fiber to support demonstrations, business meetings and other events that exhibitors host in their booths. The Connection Request System will open to exhibitors on July 13, 2018. 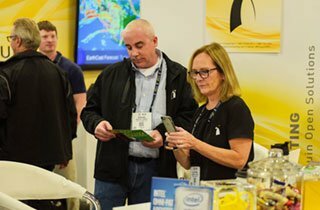 Those who need a network connection for their SC18 Exhibits booth can learn more on the SCinet Network Requests page. SCinet is providing exhibitors with this early notice of the change to allow adequate time to prepare since singlemode fiber requires a compatible optic. SCinet suggests exhibitors purchase the correct equipment before the event so it can be delivered prior to set up. SCinet can facilitate purchase of the equipment on behalf of exhibitors if requested. Exhibitors with questions are encouraged to contact SCinet Support now (support@scinet.supercomputing.org), so all requirements are understood and equipment is ordered, delivered onsite and ready to install by November’s setup. For full details on connection types and optics, please see the SCinet Connection Request System FAQ by clicking here. SCinet is the fastest and most powerful network in the world for the duration of the annual SC conference. 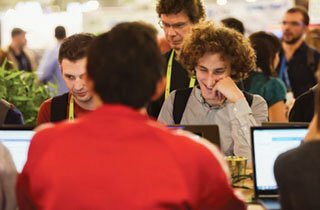 It provides attendees with a dedicated high-capacity network infrastructure, designed and built by volunteer experts from industry, academia, and government. Planning begins a year in advance and culminates in a high-intensity installation just three weeks before the conference.